Click/touch this help panel to close it. Zoom in and out of media using your mousewheel or with a two-finger 'resize' action on a touch device. Use the mouse or your finger to drag the image or the view area of the image around the screen. < and > at the left and right hand side of the screen move forwards and backwards for the other images associated with the media you selected. 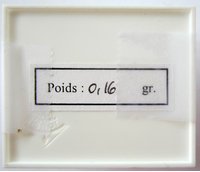 Usually this is for further photos of the same specimen. Keyboard shortcuts: use the left and right arrow keys. > in the bottom center, raises the information box giving details and further options for the media, < at the top of this box then hides it. Keyboard shortcuts: use the up and down arrow keys.
? opens this help window. Keyboard shortcuts: use the H key or the ? key. Video files have a standard set of video controls: - Reset to start, - Skip back, - Play, - Pause, - Skip forwards. Keyboard shortcuts: You can stop/start video play with the P key. Animation (usually 360 degree spin rotations) have their own controls: - enable spin mode. Note that while images are loading this option will not be available but will be automatically activated when the animation has loaded. Once active you can spin the image/change the animation by moving your mouse or finger on the image left/right or by pressing the [ or ] keys. The button switches to move mode so that you can use your mouse/fingers to move the image around the screen as with other media types. The button, or the P key will start playing the animation directly, you can interrupt this by using the mouse or finger on the image to regain manual movement control. Stereoscopic 3D image viewing requires a suitable 3D television or monitor correctly configured for your computer. Passive 3D systems such as LG 3DTVs are the easiest to configure for this. To enable/disable 3D stereo display of a compatible stereo pair image press the 3 key. If the left/right images are reversed on your display (this often happens in full-screen mode) press the 4 key to reverse them. This image is copyrighted. Unauthorized reproduction prohibited. Terminated hexagonal crystal of pezzottaite. Specimen from the first (and unique) find in November 2002. 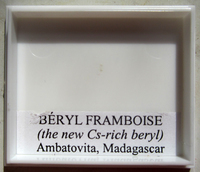 Before September 2003 when it was recognized as a new species it was know undr the trade name Raspberry beryl (in french beryl framboise) (see the label). Photographed by, and in the collection of Dan Costian. 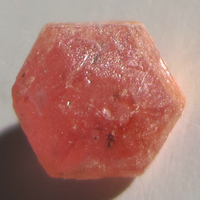 Mindat.org is an outreach project of the Hudson Institute of Mineralogy, a 501(c)(3) not-for-profit organization. Public Relations by Blytheweigh. Copyright © mindat.org and the Hudson Institute of Mineralogy 1993-2019, except where stated. Most political location boundaries are © OpenStreetMap contributors. Mindat.org relies on the contributions of thousands of members and supporters.